This year, the first week of June belongs to video gaming. Over the course of four days every major video game developer and publisher in the world will gather in Los Angeles at the E3 Expo to talk about the future of gaming and battle to win over new fans. "The purpose of this show is for the world to see what's coming next to video games," said Mike Gallagher, CEO of the Entertainment Software Association, which puts on the show annually. "E3 is the only show of its kind." As with past shows, all eyes are on console makers to make the biggest splashes at the show. "E3 is really a show about Sony, Microsoft and Nintendo," said Geoff Keighley, executive in charge of video games for SpikeTV and host of GameTrailers TV. "At the end of the day, big headlines come out of those big press briefings. "I think there will be significant hardware announcements from at least two of the three this year." Among the rumors are rumblings that Microsoft is working on motion control technology that will use a camera instead of a controller for its Xbox 360. Sony is said to be prepared to unveil a new Playstation Portable that will rely entirely on digital purchases in lieu of disc-based games. There is also talk of Sony showing a motion controller of their own. Microsoft&apos;s Full Body Motion Controller Revealed? Nintendo, currently in first place for this generation of the console wars, remains tight-lipped about what may come out of their big press conference. While Keighley didn't name a victor for the upcoming big press conferences, Scott Steinberg, author of several books on the video game industry and a games journalist, was willing to guess. "I think Microsoft stands a great chance of having the best press conference," he said, pointing to the possible news of a new way to play games coming from the company. There will be plenty of video games to show off as well, including the new Beatles-themed Rock Band, a Tony Hawk game that uses a skateboard-shaped controller and sequels to popular franchises like Modern Warfare, God of War and Mass Effect. One big title that won't be at the show is Capcom's zombie-killing Dead Rising 2. Concern over possible Swine Flu outbreaks led the Japanese-studio to sideline the developers appearance at the big show. Japanese developers Koei and Square-Enix have also cut back on folks attending the show over similar concerns. The ESA's Gallagher said the show got the thumbs up from health authorities to proceed, but calls the timing of the outbreaks unfortunate. 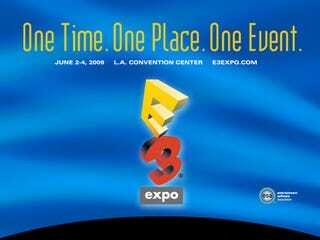 Perhaps unfortunate because this year's show marks a return to some of the glitz and glamor of past E3s. Over its 14-year history, E3 has seen the introduction of every console from the Nintendo 64 to the Playstation 3, Wii and Xbox 360, along with countless video games. The show hit a record attendance of 70,000 in 2005, but two years later it was downgraded to a shadow of itself, limited attendance to about 5,000 and nearly killed off the spectacle of the annual event. This year some of that spectacle returns, as the show expects 200 exhibitors and 40,000 people to pack into the Los Angeles Convention Center. "We will see a little bit of the magic being recaptured," Steinberg said. "It won't be the E3 of the glory years, but it certainly won't be the subdued affair we have seen in previous years."